</center<I’m happy to see that Netflix is now streaming all seven movies written and directed by Albert Brooks, beginning with “Real Life,” his 1979 parody of the PBS series “An American Family,” which was arguably the first reality show. The movie is uneven, but has some very funny portions, particularly those including Brooks’ interaction with Charles Grodin. Brooks followed that up with his three best films. 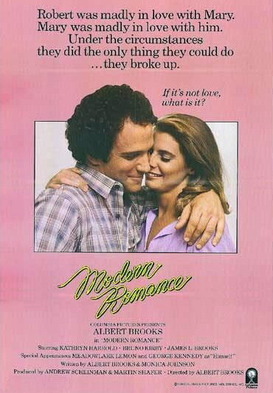 I’ve probably seen “Modern Romance” (1981) over a hundred times and could recite all of its dialogue for you from memory. It’s the story of a very neurotic man who breaks up with his girlfriend in the first scene, then regrets it and spends the rest of the movie trying to win her back. At the same time, he’s also a film editor cutting a cheesy space movie starring George Kennedy (its director is played by James L. Brooks, who would later put Albert to marvelous use in “Broadcast News”). While the scenes with Kathryn Harrold as Albert’s love interest are very good (they were a couple offscreen, too), it’s the scenes with his assistant editor (Bruno Kirby) that still make me fall off the couch laughing. I would tell you more, but I don’t want to tip it. 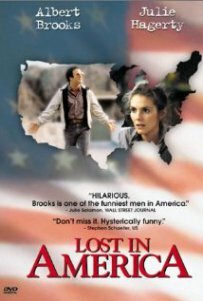 Next was “Lost In America” (1985), in which advertising executive Brooks is so enraged at not getting a promotion he was sure he deserved that he quits his job and stomps out. He then goes to his wife’s office (Julie Haggerty) and convinces her to quit her job. How will they survive? They sell their house, cash in their retirement plans, and buy an RV to travel around the country for the rest of their lives. Things go awry in Las Vegas, where Brooks has a scene with Garry Marshall (as manager of the Desert Inn casino) that is in my Top Ten Funniest Sequences In Movie History…. 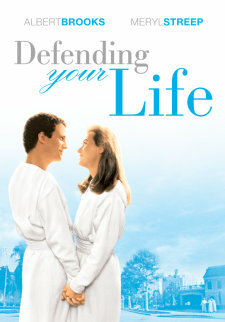 Brooks followed that with “Defending Your Life” (1991) in which he proved that Meryl Streep can do comedy. They’re both newly dead people who have to go on trial in Judgement City to prove that they’ve overcome their fears and are ready to advance in the universe. Rip Torn is hysterical as Brooks’ defense attorney who has to take on Lee Grant as his prosecutor. There are some very funny set pieces around meals (“You like pie?”) and a cameo appearance at the Past Lives Pavilion that played really big 25 years ago. After those three, the quality of Brooks’ material dropped off. He had Debbie Reynolds play his “Mother” (1996), but couldn’t come up with enough clever stuff for her to do other than playing a cloying parent he whines about constantly. In “The Muse” (1999), he’s a Hollywood screenwriter who can’t develop a winning script until Jeff Bridges recommends getting advice from his muse (Sharon Stone). It’s funnier than “Mother,” but that’s not saying much. Then there’s the worst of the seven, “Looking For Comedy In The Muslim World” (2005). If the title doesn’t tell you enough, note that Brooks made this one two years after the US went to war in Iraq — and then had to film it in India where, yes, there are a lot of Muslims, but it missed the mark repeatedly. You can actually see Brooks straining for laughs throughout.  Brooks has also had a career doing good work in other people’s films, most famously as Marlin in “Finding Nemo” and “Finding Dory,” as well as the aforementioned “Broadcast News,” plus “Out Of Sight” and “Concussion.” But it’s the triumvirate of “Modern Romance”/”Lost In America”/”Defending Your Life” that will stand as the peak output era in the Albert Brooks filmography.